Big Ideas Fest, is a unique three-day gathering focused on creating solutions and taking action within an inspiring and immersive design environment. This year’s theme, Democratizing Access to Education, is about addressing timely issues impacting education, such as access to knowledge, information justice, affordability, basic needs, and cultural inclusion. In partnership with our co-host, Creative Commons USA, at American University Washington College of Law, we’ll examine core assumptions and values that we hold true, and determine who, how, and what is needed if we truly intend to democratize access to education for all. Produced by ISKME, Big Ideas Fest is a global gathering designed to encourage cross-fertilization of ideas, featuring innovators who provide first-hand accounts of how a simple spark of curiosity and empathy fueled remarkable change; as well as ample time to network with other participants, and Action Collab design thinking workshops that engage small groups to collaboratively brainstorm, prototype, and ultimately test solutions to challenges in education. Come join us for what this historic opportunity in our nation’s capital. Thursday, November 29th - Sunday, December 2nd for ISKME's 9th annual Big Ideas Fest at the American University Washington College of Law, in Washington DC. After hosting Big Ideas Fest in California for the past decade, we are thrilled to bring this dynamic event to the East Coast. Watch RapidFire talks and Keynote speakers from previous years. See snapshots of the action on our Flickr Big Ideas Fest photostream. View the Big Ideas Fest 2018 Speakers. 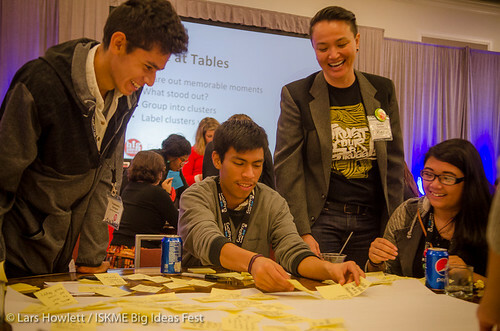 Our goal at Big Ideas Fest is to provide a safe place where people can be creative and share ideas. Our spaces are inclusive of all participants, based on treating everyone respectfully, regardless of gender (including transgender status), sexual orientation, age, disability, medical conditions, nationality, ethnicity, religion (or lack thereof), physical appearance, politics, or ideology. Treating each other with respect, professionalism, fairness, and sensitivity to our many differences and strengths, including in situations of high pressure and urgency. Communicating constructively, and acknowledging the contributions of others--and, if you're not sure, asking someone instead of assuming. Avoiding demeaning, discriminatory, harassing, hateful, or physically threatening behavior, speech, and imagery. Please report any inappropriate or harassing behavior immediately to the event organizers, and please enjoy your time with us.